The recipe I originally followed when I made this as an Apple Gruyère pie came from The Rice and Spice Cupboard. To make the Pear Gruyère pie, I played with the crust a little bit adding in an ounce more gruyère pie. Yum. 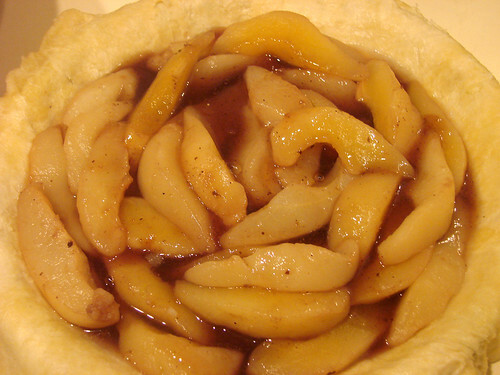 For the poached pear, filling I relied on advice from mom and a little bit of freestyling. Hope you enjoy! Whisk together the flour, salt, sugar and grated gruyere in a large mixing bowl. Using a food processor, mix butter and flour/cheese mixture until the largest butter chunks are the size of large peas. Remove flour/cheese/butter mixture from food processor return it to the large mixing bowl. Sprinkle ice water over flour in increments of one tablespoon, toss with fork after each addition. Be careful not to add too much water. You can get an even water distribution by adding putting the water in one of those spritzer bottles. When dough begins to clump together as you stir, test the dough by squeezing it in your hands, if it forms in a lump then gather the rest of the dough together into two separate disks, leaving one slightly larger than the other. Wrap the dough in plastic wrap and refrigerate overnight. Or if you are in a rush, toss the dough in the freezer for about an hour, when it's solid yet still gives slightly under your touch, it's ready to go. Add sugar, wine, water, vanilla, cinnamon stick, ginger, nutmeg and clove into a large stock pot or dutch oven. Bring to a boil. Put an empty medium bowl into the freezer to chill. Peel and halve pears. Scoop the core and seeds out and then cut the halves in half. Once liquid mixture has come to a boil add cut pears. Simmer for about 20 minutes until the pears are tender. Using a slotted spoon remove the pear quarters from the poaching liquid and put them into the chilled bowl. Return the poaching liquid to a boil and reduce until you have about 3/4 of a cup of syrup. Add 2 teaspoons of cornstarch to the syrup to thicken the syrup further. Pour the syrup into a measuring cup and chill. In the meantime, roll the larger piece of dough into a circle around fourteen inches in diameter. I roll out the dough between two pieces of plastic wrap to keep it from sticking. Peel off one side of the plastic wrap and center that side of the dough in the pie plate then remove the other sheet of plastic wrap. 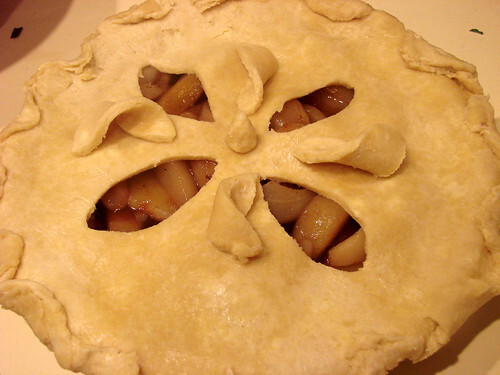 Remove the pears from the chilled bowl layer them into the bottom of the pie. Pour the syrup on top of the pears. 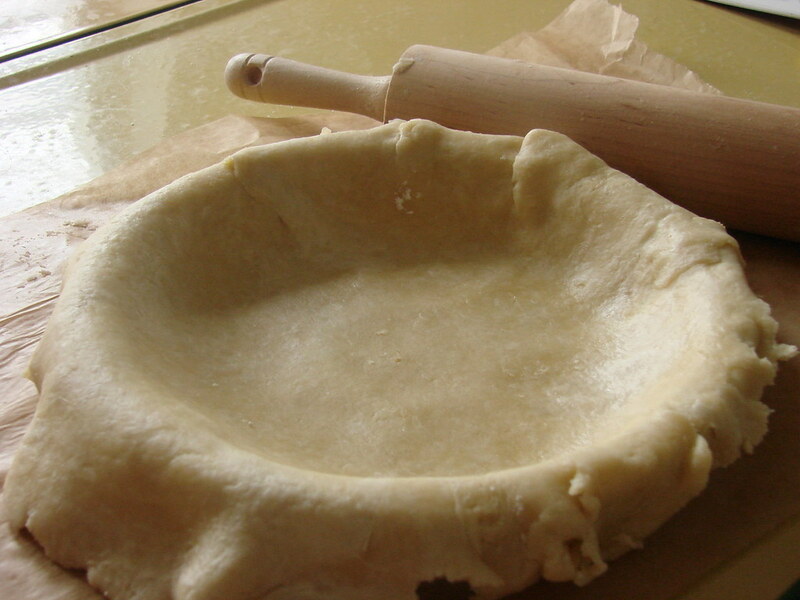 Roll out the slightly smaller dough dish into circle around twelve inches in diameter. Place this dough round on top of the pie. Seal the crusts together using a fork or your fingers. 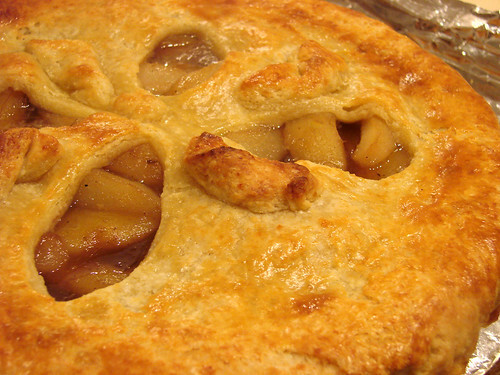 Brush the top of the pie with the beaten egg, and make three parallel slits in the top crust to allow steam to escape. Or if you are feeling fancy pantsy, feel free to make decorative cutouts. Put the pie on a cookie sheet to catch any drips--I like to cover my cookie sheet with parchment paper or aluminum foil to minimize the mess. Put the pie in the oven, bake until the crust is golden and you can see the filling bubble up between the slits in the crust, about 30 to 40 minutes. Cool and serve with vanilla ice cream. Now I'm new to this pie baking thing, but this pie was abso-freaking-lutely delicious. Really, really good. The extra gruyère and all that butter made the crust super tender and flakey. This recipe is definitely a keeper. I adore Pushing Daisies too! How creative of you to use the Pie Holes as inspiration!! :) This looks extremely delish. I want to make this! Well, truly, I want to eat this, but if making it is the gateway, then, well, I'll do it! Awesome crust! I'm making this now for thanksgiving--it's in the oven, but so far it tastes DELISH! We added a pinch of salt to the syrup before pouring it over the pears, to give it a little flavor boost. Thank you so much for this recipe! I am currently waiting for the pie to finish baking and everyone in the house is circling slowly in anticipation. I've wanted to make this pie since it was first mentioned on the show. It is my first pie and your directions were clear, and concise. I'm sure it will end up perfect. 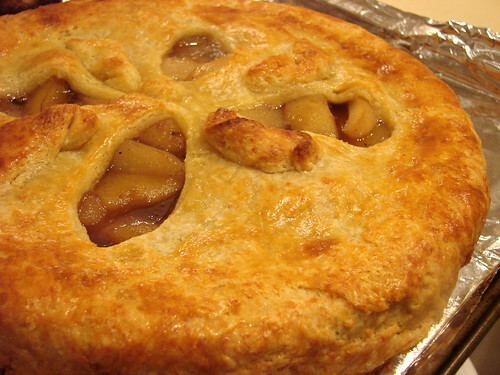 I love Pushing Daisies, and I LOVED this pie. Thank you! I just made this pie and it was FABULOUS!!!! Way to go!!!!! Delicious! It's pretty much amazing. Thanks for the recipe!